If you are like me, you don’t stay at bright and easy to find targets. You like to see these elusive faint fuzzies that are on the threshold of visibility. This kind of target will not be seen in the telescope at once. You’ll need to know exactly where you are to locate it – and by exactly I mean more accurate than any goto mount or digital setting circles can do. The only way to achieve this is by starhopping, and a finderchart which is good enough. As for many of you, this meant I had to bring a pile of printed star charts from Megastar to the field. In many cases, Megastar wouldn’t know the object, so I had to pin down the object’s position manually. Or I had a printout of an DSS image as well, which showed the position, extent, and detail of the desired object. Now imagine there was a tool that would have DSS findercharts for 2500 of the “coolest” objects in the sky – from the Ring Nebula to Einstein’s Cross, from M 87’s jet to Zwicky’s Necklace. Imagine all charts would be comparable with each other, and let you assess position, size, intensity, details of the object. At the same time, they would show finder and comparison stars for all of these 2500 objects and name loads of fainter objects in the field. 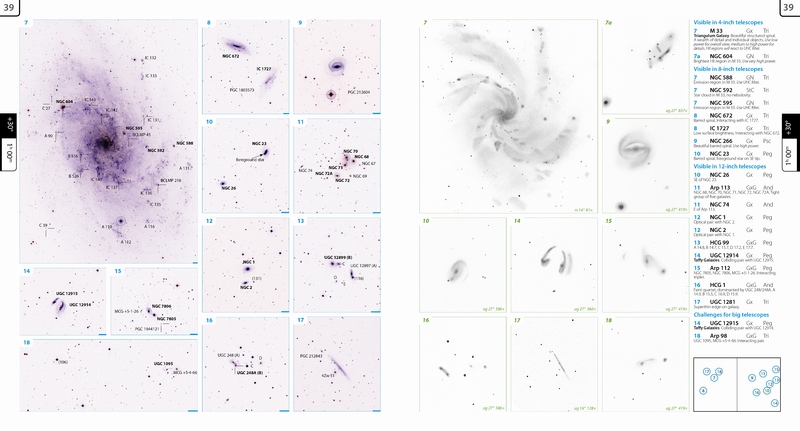 Imagine this same tool would also have more than 800 high quality drawings from experienced observers, that show you what would be possible to see with large scopes under perfect skies. Imagine this tool would tell you if there was a dark lane or double nucleus in that galaxy, and give hints on what magnification to use and which filter to employ. And imagine this tool would be waterproof, did not require any batteries, or ruin your dark adaptation. It will only be a few more weeks until this dream comes true: interstellarum Deep Sky Guide will be published jointly by Cambridge University Press and Oculum-Verlag. 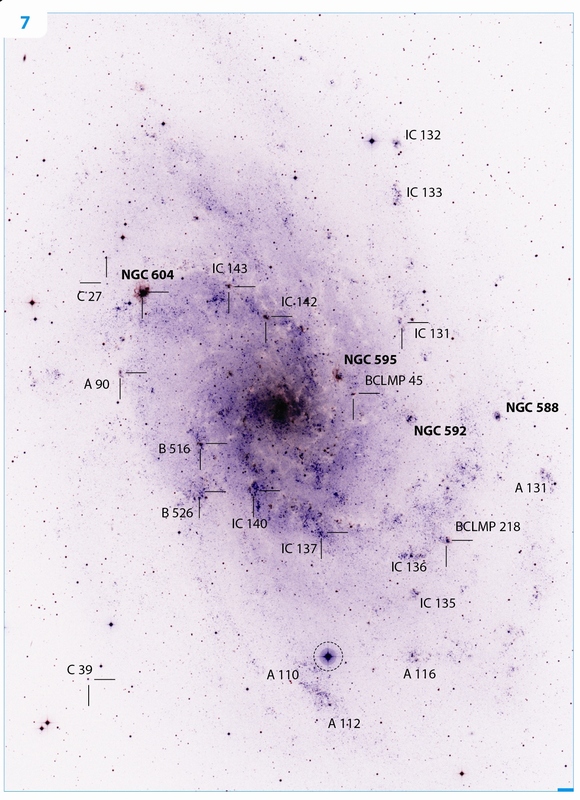 Chart 39 from the interstellarum Deep Sky Guide features M 33 and a lot of other targets. Entire sky (including southern sky) in one volume. 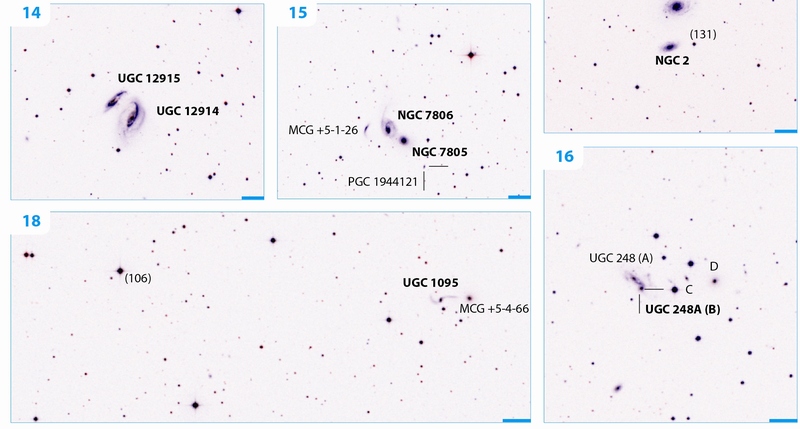 About 2,500 deep-sky objects shown, with catalog number, object type, constellation, nickname, short descriptions, and observational hints. More than 1,000 color finder charts, using red and blue channels of Palomar Observatory Sky Survey II plates. Scale is shown by blue bars on lower right corner of each chart. About 800 detailed pencil drawings made by Uwe Glahn and myself which provide the best approximation of what may be seen visually in large scopes. The DSS findercharts are especially useful on fainter targets. Neighbouring objects and comparison stars (mags in parantheses) are labelled. The Guide features the same visibility classification as the Atlas, which is of course dependent on conditions and experience, but helps unexperienced observers to find suitable objects. This example of the bicolor DSS images in interstellarum Deep Sky Guide shows M 33. 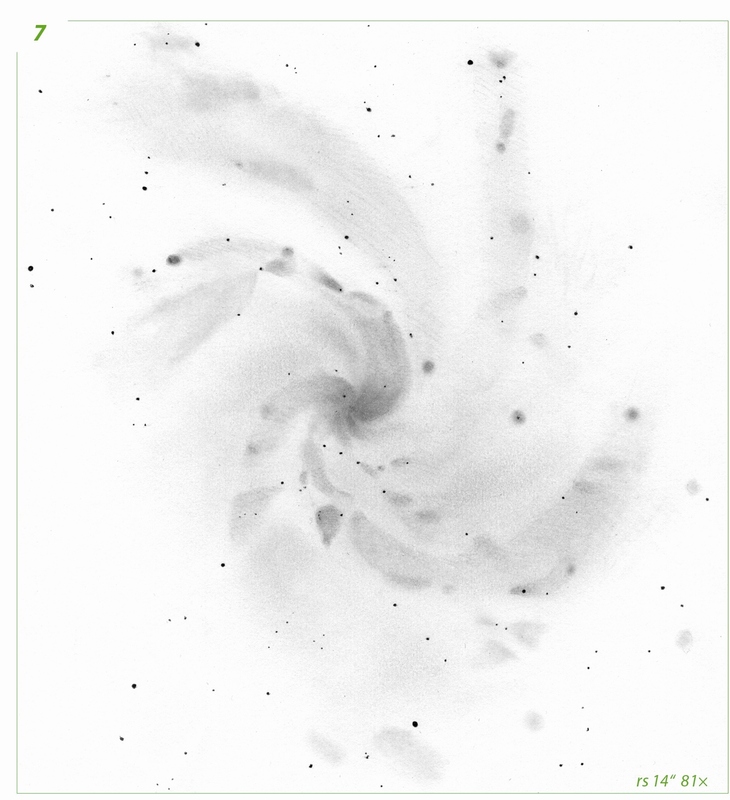 Aditionally, the drawing of M 33 with an 14-inch Newtonian gives an impression what may be seen visually. For me, deep-sky observing will not be the same again. Forget printed charts or DSS printouts. Forget time consuming preparation of observing lists, and research about background info and other observers’ results. Just grab the Atlas and Guide, and go for a night of deep-sky observing whenever and wherever you are! 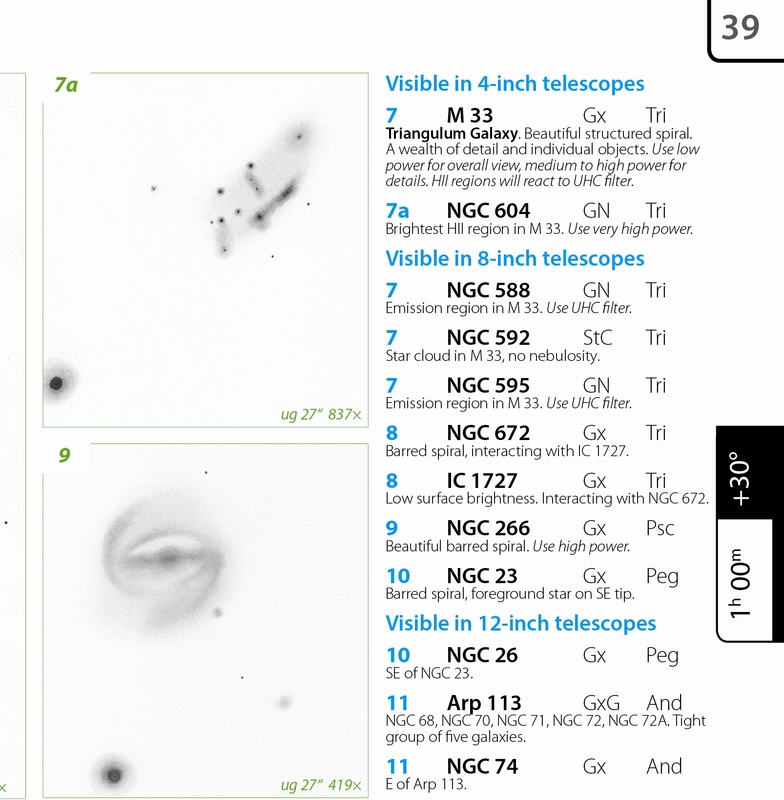 PS: We are looking for telescope dealers who would like to make the Guide available to the US market. Please contact Oculum-Verlag if interested. I noticed your announcement of the upcoming interstellarum Deep Sky Guide. We’d love to announce it in the magazine when you are ready, so please keep us advised. I just digged out your comment from heaps of spam, so it went unanswered unintentionally. Did you already have a chance to review the Guide? 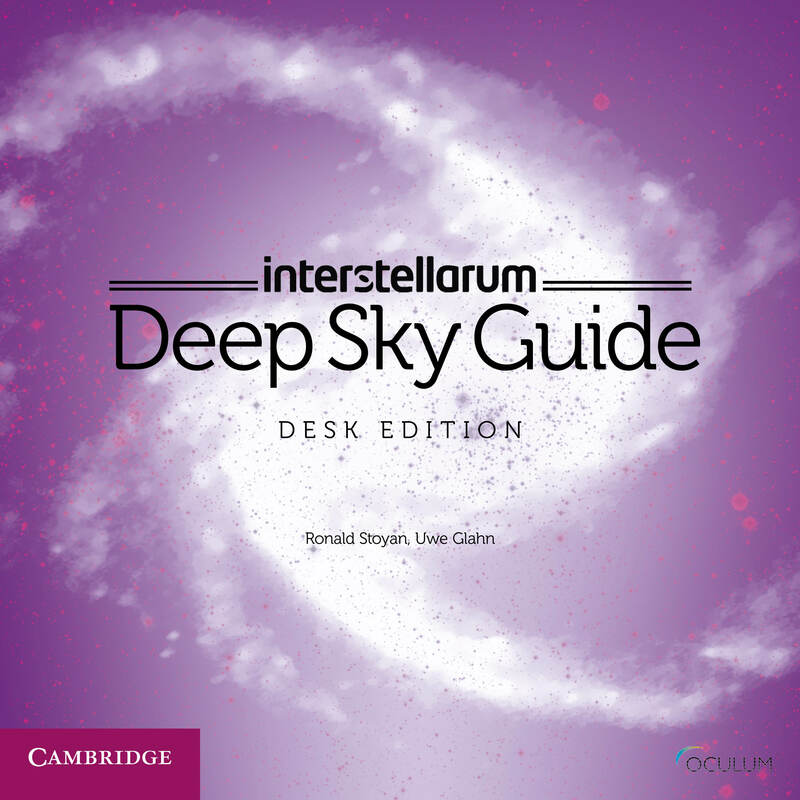 Pingback: First impressions of Interstellarum Deep Sky Guide, a short review.